We are pleased to introduce a new segment on Write Crow – APPLAWS. APPLAWS (pronounced “applause”) will share the team’s awards, publications, plans, leadership, achievements, woots, and surprises three times each year. Crow has always shared our celebratory work and the new division of the blog continues that work. The APPLAWS is a recurring cross-institutional update about our accomplishments blog. APPLAWS is spearheaded by the Purdue University undergraduate intern with assistance from a graduate researcher. 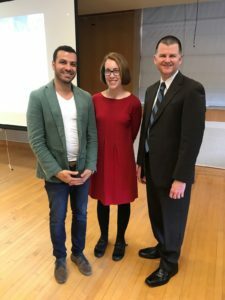 Hadi Banat and Rebekah Sims are conducting a three-semester research study (Spring 2017, Fall and Spring 2018) in paired First-Year Writing classes of domestic and international students to examine how writing curricula and cross-disciplinary pedagogy influence the development of undergraduate students’ intercultural competence. Together with Dr. Bradley Dilger, they are developing a unique data-driven approach to teaching composition that caters to the needs of academic discourse communities having a variety of student populations. This “Transcultural Approach to Introductory Composition” was awarded “Most Innovative Syllabus Approach” at 2017 ICaP Showcase, and also received a $2,000 Center for Intercultural Learning Mentorship Assessment Research (CILMAR) mini-grant to fund research with a clear plan for intercultural assessment and significant impact at Purdue. Hadi Banat also won Purdue’s 2017 Writing Lab Graduate tutor of the year for his excellent tutoring work and his commitment to tutoring and Purdue Writing Lab events and training. Sherri Craig, Purdue doctoral candidate,w as awarded a 2017–18 Purdue Research Foundation dissertation fellowship for “Mentoring on the Front Line: An Interrogation of Mentoring and Training Practices within Composition Practica.” The fellowship will provide Sherri a calendar year of support for her dissertation research, which is an empirical study of the well-known but irregularly studied composition practicum. Sherri will be sharing preliminary work at CWPA 2017 and in an edited collection and plans to defend in April 2018. Olga Chumakova will be graduating with a Master of Arts in English Applied Linguistics. She has been accepted to the Second Language Acquisition and Teaching doctoral program at the University of Arizona for Fall 2017. This summer Olga will be teaching writing with the New Start, a summer bridge program for students entering college in Tucson. Kati Juhlin is graduating with a BA in Linguistics and Judaic Studies. She has an internship teaching position with The Evangelical Alliance Mission (TEAM) cultural center in Guadalajara, Mexico next year. She has also been accepted to the MA in English Applied Linguistics program at the University of Arizona for Fall 2018. Samantha Kirby will be graduating with a Master of Arts in English Applied Linguistics. She will be presenting on the language expert gamers use to initiate novice gamers at CALICO in May. She is currently interviewing for jobs, in hopes to be working with her two loves: video games and language. Blair Newton, the undergraduate intern at Purdue, won a 2017 Crouse scholarship for professional writing. Blair will be working as an intern at O’Kelley & Sorohan in Summer 2017. Shelley Staples, PhD (University of Arizona) was promoted to Associate Professor of English and awarded tenure! Her current projects focus on academic writing and healthcare communication. She has upcoming presentations at CALICO and Corpus Linguistics 2017. We are very proud of Shelley’s accomplishments and are excited for the next chapter in her research. Ashley Velazquez, a doctoral student in Second Language Studies at Purdue, became ABD (all but dissertation) and rose to candidacy! She defended her dissertation prospectus, “What’s the ‘Problem’ Statement? : An Investigation of Problem-based Writing in First-year Engineering,” and will begin working on the pilot study which will shape her work this summer.